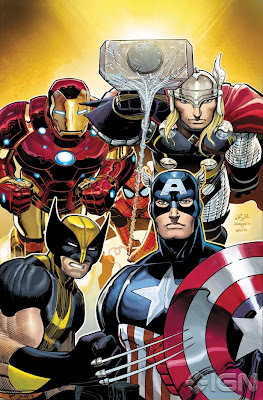 So far we know Captain America, Iron Man, Thor, Hawkeye and Spider-Woman assemble for duty in the pages of Avengers #1. Now John Romita Jr's hot cover for the debut issue has struck at IGN, it seems Spider-Man and Wolverine are being added to that mix. With still no word from Marvel on if this is the final line-up, it looks like there's still a bit of space for some of my 'dream team' members yet! Excellent. This is a must!